This report contains results of a quantitative analysis of the Canon 40D and Nikon D300 DSLR's, from the standpoint of sensor capabilities. Images were taken with the Canon 100-400L IS lens on the 40D and the Nikon 80-400VR lens on the D300. Several measurements were undertaken: Sensor read noise, dynamic range, pixel photon collecting efficiency, and relative sensitivities. 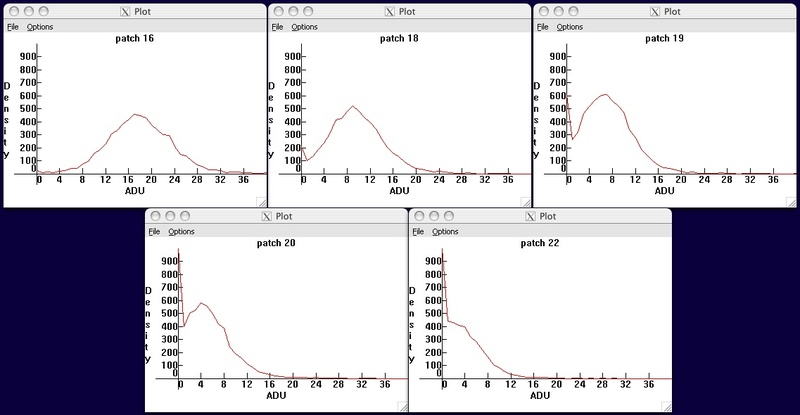 Fig.1 - Histograms of black frames for various ISO settings (the horizontal axis is raw levels or ADU; the vertical axis is the number of pixels having that level). 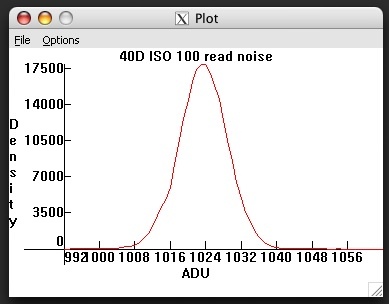 Fig.1a - Histogram of D300 (14 bit) raw data as exposure level approaches zero. Fig.2 - Histogram of 40D blackframe. The nonlinear distortion of deep shadows in D300 raw data by clipping means that it will be a poor choice for astrophotography, or any application where pulling weak signals out of the noise at very low illumination levels is of importance. 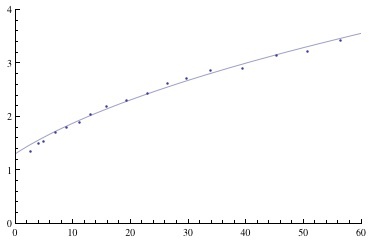 Fig.3 - Standard deviation of green channel patches as a function of mean raw level; D300 at ISO 200. Table 1: D300 read noise vs ISO. Table 2: 40D read noise vs ISO. The read noise gives an edge to the D300 at ISO200, while at higher ISO the 40D has an increasing advantage, up to almost 1/3 stop at ISO 1600. Neither camera exhibits significant pattern noise (banding) in deep shadows. Table 3: D300 dynamic range vs ISO. Table 4: 40D dynamic range vs ISO. As an aside, the D300 has an ISO extension, at both the high and low ends. The lowest ISO was measured to have an actual sensitivity of ISO 125, using the relative photon collection efficiencies reported below. ISO 6400 appears to be a true ISO for the D300, insofar as there are no gaps in the histogram of the green channel raw data; for the 40D, the high-ISO extension to 3200 is achieved as a push of ISO 1600, by multiplying all raw values by two after quantization and hence there are no odd levels populated in the raw file. Table 5: Sensor efficiency of the D300 (electrons/12-bit ADU) at various ISO, in each color channel. Not surprisingly, the 'gain' is inversely proportional to the ISO amplification, since doubling the ISO for given shutter speed and aperture halves the number of photons collected. The LO ISO extension reveals that its sensitivity is ISO 125, assuming ISO 200 and the rest are calibrated correctly. Now, the photosite electronics is the same from pixel to pixel; different color channels differ only by the color filter overlaying the photodetector, therefore there should be no difference in the 'gain' between different color channels. The anomalous discrepancy in 'gain' observed in different color channels is attributable to a software multiplication of the digital signal after quantization but before writing out the raw data. Looking at the histograms of the three channels, there are no gaps in the green channel data, while there are gaps in the blue data indicating that it has been rescaled by a factor 20/17~1.18 after quantization; and gaps in the red data indicating a rescaling by a factor 11/9~1.22 after quantization. Correcting for these factors, all three color channels exhibit the same sensitivity for the underlying photodetector, as they should. Separate measurement of the efficiency in 14-bit mode at ISO 200 yielded 1.40 e-/ADU in the green channel, and 1.14 e-/ADU in each of the red and blue channels -- quite consistent with the 12-bit results (they should and do differ by a factor of four reflecting the fact that a raw level in 12-bit quantization equals four raw levels in 14-bit quantization). By way of comparison, the 40D sensor collects 3.1 electrons/14-bit ADU at ISO 100 in all three color channels, again decreasing in inverse proportion to ISO gain. This translates to 6.2 e-/12-bit ADU at ISO 200. 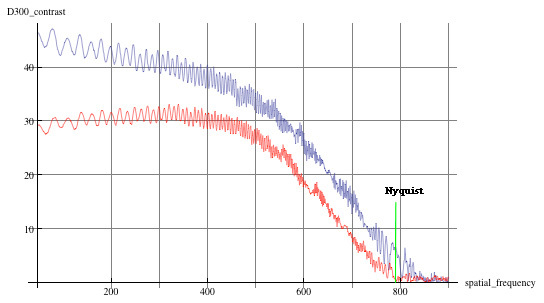 To normalize, note that the D300 has 5.5 micron pixels, while the 40D pixels are 5.7 microns. Scaling up the D300 green channel efficiency by the ratio of pixel areas gives 5.9 e-/12-bit ADU at ISO 200; the 40D gets 6.2 e-/12-bit ADU. So the 40D has a 5% advantage in light collection efficiency per unit area of sensor, and a 13% advantage at the pixel level, for the green channel. Table 6: Relative sensitivities D300 vs 40D in each color channel. For the first row of the above table, the raw levels as percentage of raw saturation level were recorded; the entry in the table is the ratio of those percentages for each color channel. In the second row, the software multiplication of D300 raw data has been undone to reveal the sensitivities of the pixels themselves, giving a more accurate picture of the relative transmissivities of the corresponding color filters. It would appear that overall, the D300 is up to 1/3 stop more sensitive than the 40D. This result seemed curious, and so further analysis was undertaken. In order to rule out effects of the lens, differing calibrations of shutter speed and aperture, etc, a second test was conducted. The cameras were placed side by side with no lens. Both were set for two second exposure in a darkened room; in the middle of the exposure a 580EXII flash with diffuser was set off at 1/64 power, illuminating both sensors equally (a second set with the cameras interchanged was taken to rule out stray reflection effects etc; and an exposure without flash to determine the amount of ambient light, which turned out to be essentially zero). This test revealed much more consistency between the two cameras. Table 6a: Relative sensitivities D300 vs 40D in each color channel -- bare sensor measurement. At this point the evidence seems to suggest that the relative sensitivities are comparable, and that the ISO calibration of the two cameras are the same within measurement error. Perhaps the discrepancy with the previous test can be attributed to differences in exposure time and lens aperture, transmissivity, etc. ; with the lens out of the way and both sensors exposed to the same light source, the difference between the green channel sensitivities of the two cameras observed in the initial test disappears. Here the blue curve shows horizontal resolution, while the red curve gives vertical resolution. The horizontal and vertical scales are somewhat arbitrary (the horizontal scale is related to the logarithm of the spatial frequency). The rapid oscillation on small scales is an artifact of the analysis method and should be averaged out for the purpose of interpretation. 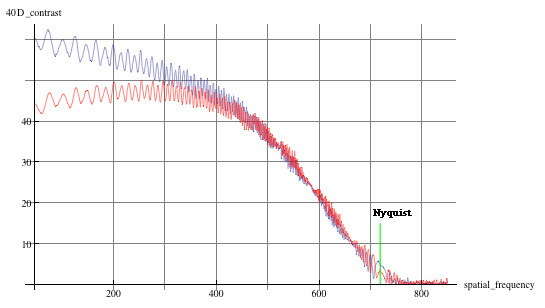 Both cameras show response out to the Nyquist frequency (the theoretical limit of resolution), which is 90.6 lp/mm for the D300, and 87.7 lp/mm for the 40D. MTF50 for the D300 is about 42 lp/mm for the D300, and 44 lp/mm for the 40D. To translate these figures into line pairs per picture height, multiply the D300 results by 31.6 and the 40D results by 29.6. Qualitative measures of image quality: The sensor efficiency is a useful metric of image quality. Since photon noise decreases relative to signal when more photons are collected, and photon noise is the dominant source of noise in midtones and highlights, noise in these exposure zones is least for the sensor collecting the most photons. One should be careful though as to what measure of "most photons" is used; more about this below. Table 7: Photosite efficiencies, in electrons per 12-bit ADU at ISO 400. This figure of merit quantifies the light-gathering ability of the corresponding pixels, and thus the image quality when viewed at 100% magnification. For instance, one sees that a 1D3 pixel is over 1/2 stop more efficient than a 1D2 pixel, despite being smaller. 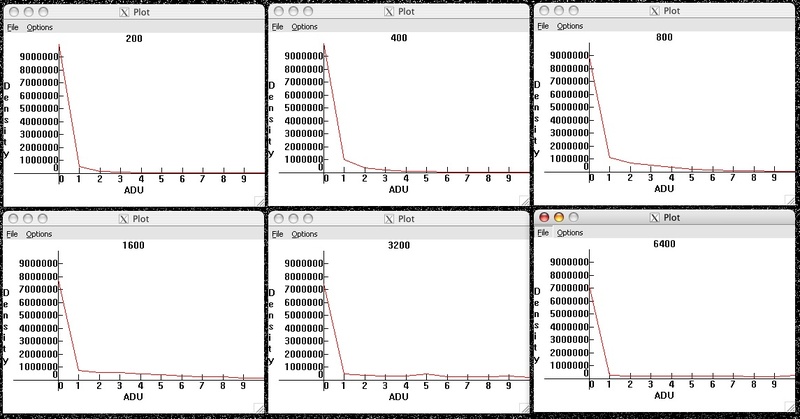 Table 8: Light collecting ability per unit area: Photosite efficiency divided by pixel area in square microns. Table 9: Sensor light collecting ability: Photosite efficiency multiplied by megapixel count. This metric gives the relative light collecting efficiency for equal percentage areas of the frame. Here the D3 and 1Ds3 really shine, though clearly the results are (apart from the rather poorly performing 1D2) basically grouped into categories by sensor size since larger sensors typically collect more photons.